Awww, how cute is she? It’s 12:30 on Thursday night/Friday morning as I type this, and I have a stack of movies to watch and an even bigger stack of Christmas-y paper to play with. I know there’s no way I’ll make all of my Christmas cards this year, but I do have a few things that need a personal touch, and what better time to do it than now, right? Are you going to make your own cards or handmade gifts this year? Have you started, or are you a procrastinator like me? I wish the picture picked up on all the vintage glass glitter and sparkle here! There’s no stamping on this card, just a bunch of things that I pulled together from stuff on my craft table. Last weekend, my daughter and I made a little detour to our local scrapbook store on the way to do some Christmas shopping and we both “ooooooh”ed over the My Mind’s Eye holiday collection. The little girl and snowflakes were punched out and then glittered with vintage glass glitter and some dazzling diamonds, too. The punched border is one of the new big border punches from Martha Stewart that I sprayed with Elmer’s Craft Bond and then glittered with the glass glitter and dazzling diamonds, and the blue shape she’s on is a Spellbinders die cut that was embossed with my favorite Cuttlebug folder. The ribbon is some random wired organdy from my stash. Whew! Lots of stuff, huh? Loved the sketch this week – it’s what I call an old reliable. . . Strip on the left, something on the lower part of the card, some ribbon, and done! You can find it here. For more takes on Lori’s sweet sketch, visit Cami, Charmaine, Lori, and Sharon. As always, I’m excited to see what they’ve shared. . . Girl, that is so so cute! LOVE the big wired ribbon bow. LOVE all the sparkle. I was dreaming about stamping at that time. I can’t function after 10 p.m.
aweeeee… I LOVE all the sparkle 🙂 So cute! VERY stinkin’ cute! Love all the glitter and that big ole’ Martha punch — wow! 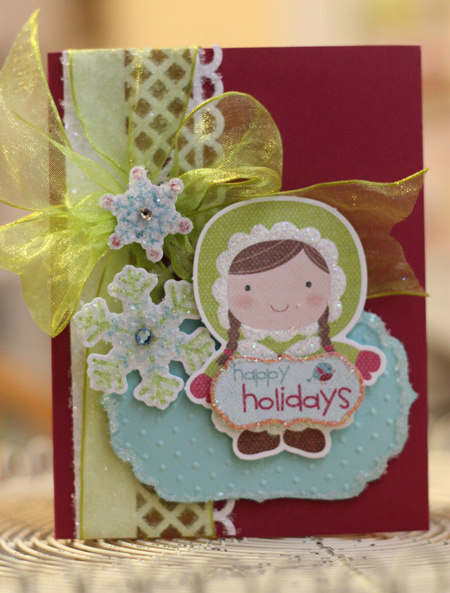 Sweet use of the snowflakes, too, and lovely ribbon! Can’t wait to see you tomorrow! LOL.. YOU CHEATED TOO! I love that paper pack! 🙂 CUTE Jenn… love all the sparkle! Have a great weekend girl! OH! You know I think this is darling…absolutely darling! Love all the glitter, the little girl…she’s adorable! 🙂 Have a great weekend! She is ADORABLE! THis is just the cutest, Jenn! love it! Have a great weekend! She is very cute, indeed! This is just adorable! So adorable, Jenn…and I love all of the sparkle!! So cute! And I’m a procratinator, by the way!! This is adorable! I love the sparkly snowflakes. No cards being sent this year. Oct/Nov ended up shot for us. Next year I made a pact with a friend we will work on them in the summer. This is SO way to cute! I adore your card! Enjoy that stack of videos and papers! Hugs from Morocco! Oh my gosh — this is fantastic, Jenn! Everything works together so perfectly, and that bow is gorgeous! She is so stinkin’ cute!!!! Love all the sparkle–love it! Ahhh so cute in every way – love this card! I hope you an yours have a wonderful Christmas and an amazing New Year! HUGS!!! She is super cute!! Love all the glitter! Hope you had a very MErry Christmas! Jenn this is so SWEET (squeal!!). Hope you had a very nice Christmas and Happy New Year to you! !